Home News Trump wants to eradicate the Palestinians! Trump wants to eradicate the Palestinians! President Trump March was not listening to flowers at the White House press conference while declaring the Syrian Golan Heights Area to be part of Israel. And pleased with the Israeli Prime Minister Benjamin Netanyahu happily sitting in front of him, he was giving such a statement that like a foreigner who was returning the goods, he was distributing mischief. President Trump gave the legitimacy of the international laws to the initiative that it is necessary for Israel’s security and defense. Because in the Civil War of Syria, Iran can use Golan Heights for attacks against Israel. 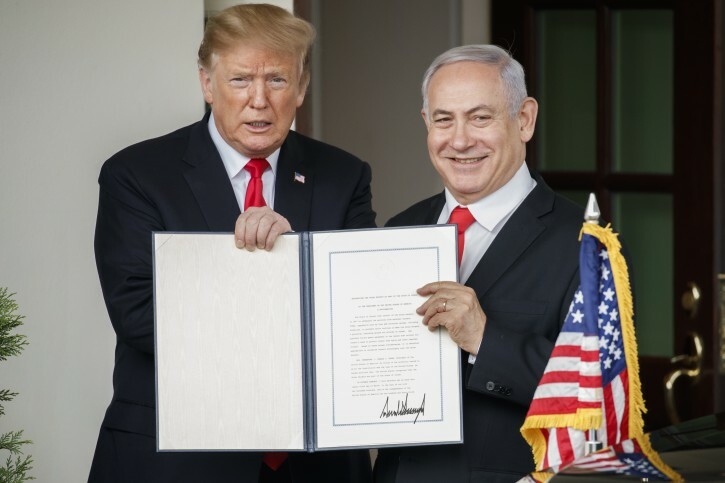 Trump said in his order that I declare that America recognizes Golan Heights as part of Israel. Their historical announcement is absolutely silent about who and what authority this US has given to America that they should share a part of a single country as part of another country. But President Trump power is so thieving that he is not conscious of looking at international laws for a moment. And Benjamin Netanyahu, who had received the decree, did not even accept international laws in the world of consciousness. During the 1967 war, Israel occupied the Golan Heights and later it was imposed in Israel. During this time, Israel had fired tens of thousands of Syrians from Golan out of their homeland and in their place Jews built to settle the Jews. As Golan occupied, the situation of the population changed radically. Israel wants to maintain its long lasting occupation because of Golan that river Jordan is in their Golan Heights. In military terms, it is very important for the Israelites that a glimpse of Golan’s entire east-east of the evening can be seen. However, during the past year, the international community did not recognize Israel’s right on a Golan and by now, a US President and his administration did not recognize Israel’s sovereignty on Golan. The European Union has shown a serious reaction to the announcement of the trumpet about Golan and said that there is no option to transfer the traum to a controlled area. The Arab League has criticized the Trump’s announcement. Since the trumps have come upside down, they have launched a crackdown in the Middle East along with Israeli Prime Minister Benjamin Netanyahu. The purpose of which is to slaughter the rights of Palestinians, break their waist and eliminate them. First of all, Trump acknowledged Jerusalem’s capital despite Jerusalem’s opposition to the whole world and the US embassy announced to move to this deserted city. Then refusing to pay their share in the UN relief fund for the leased Palestinians from their homeland, not only this, Trump supported the construction and extension of Jewish settlements in the Palestinian territories. The purpose of the announcement of the Golan Heights to recognize the territory of Israel is actually trying to bring Benjamin Netanyahu to the general elections in April. Benjamin Netanyahu is contesting in the elections with Israeli military chief Benny Gantz, which is said to be a major quinteeper. Benjamin Netanyahu charges are under corruption but Benny Gantz is very popular in his competition due to military achievements. This is the first time a US President is openly supporting and supporting any other party in a non-country election. The Palestinian threat has shown that the way the Trump has declared Golan’s occupied territory as part of Israel. Similarly, President Trump can also mention the Palestinian administration area on the West Bank as a part of Israel. Anyway, Israel has occupied 61 percent of Palestinians on the western edge by constructing Jewish settlements. President Trump says with great pride about declaring Jerusalem to recognize Israel’s capital during the decision of Jerusalem, the leaders of the world insisted that they should not do this but despite this they announced it and nothing happened and everything was alright. It means that they decided about Jerusalem and nothing was bargain, in the same way Golan would also be judged. President Trump not only hear flowers but they also do not hide their expectations that all Arab leaders who have been backing the western countries. They look and support the American President’s measures about the euphemism. The crown prince mohammed bin salman of Saudi Arabia, Mohammad bin Zahid, ruler of Abu Dhabi and Egypt’s Abdel Fattah el-Sisi has established open security and trade ties with Israel. And the other states of the Gulf want to establish diplomatic relations with Israel. Of course, the Arab countries, who had preserved the protection of Palestine’s rights and their struggle, have now given the measure to support them. And the Palestinians have been silent on what is being wronged. Last days, the US Secretary of State Mike Pompeo was asked to visit Israel if he thinks that God sent Trump to save Israel from the threat of Iran. In response to this, Mike Pompeo said that as a Christian he believes in it. It shows that the American and Israeli people are being impressed that God’s pleasure is behind the trumpet that has adopted the policy of support and support of Israel. However, Palestinian Palestinians are lonely and unaware of this time and Trump and Benjamin are thieves in the drunk of Netanyahu power, the Palestinians are working hard to mitigate the rights of Palestinians and to destroy them. If Palestinians have any supporters and helpers, they are fighting Turkey and Iran, if they are fighting against American and Israeli fascinating phenomena. But regret that they are not being supported by Muslim countries.